And here’s, as promised, part II of the Brazilian princess, the X-Crafts Embraer E-195 v2. I hope you enjoyed part I and the same I hope for this part that comes with additional information about the modelled virtual cabin, 3D cockpit and much more. When you did read part I, then you can remember that this part will include a demo flight (roundtrip) from/to KTUS. I think it would be also a good idea to explore the Tekton FMS while testing and exploring the Embraer at SBRJ, so even more surprised for you. Missed part I of the Brazilian princess review? In that case, here’s the link to our previous review. 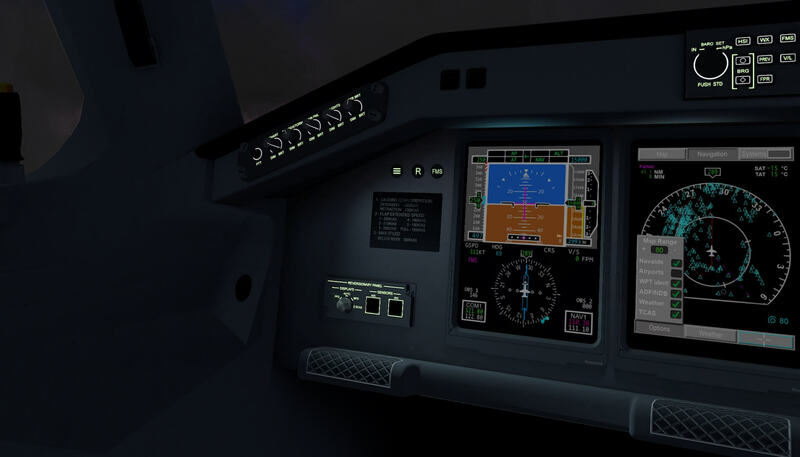 With the GPU connected and supplying the aircraft electrically, I decide to do a quick cockpit check as well as having a look in the Virtual Cabin (VC). Let’s start with the virtual cabin. This is very well done. No doubt about that. Some simmers like a virtual cabin, others have no interest at all in a cabin. Whatever you prefer, I think it’s either modelled or not. That’s up to the developer’s decision, but when he/she decides to model a VC, then I would say…. make something nice of it. And without doubt this VC is well made. The nice leather look alike seats with seat tracks are well modelled, as well as is the floor, walls and ceiling. X-Crafts did give enough attention to the VC go give it a realistic look. 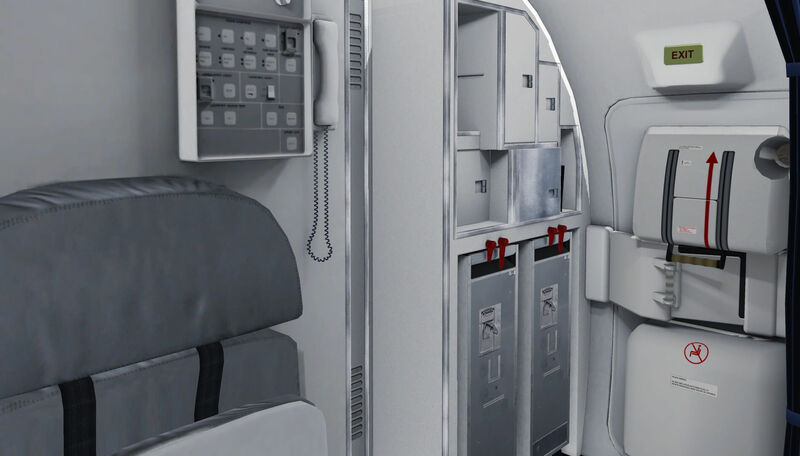 This is also applicable for galley or pantry including the toilet/lavatory units although I haven’t found any animations for the open/close control of the AFT lavatory doors, overhead bin door control etc. I noticed one small issue and that’s the seat row identification on the overhead bins. That the row identification is clearly readable is great (no blurry look or whatsoever) however, the left-hand and also applicable to the right-hand rows, shows row identification seats A – B – C while the Embraer E-195 only has two seat rows on the left and right of the isle. The pink semi-transparent divider walls are beautiful I must say. 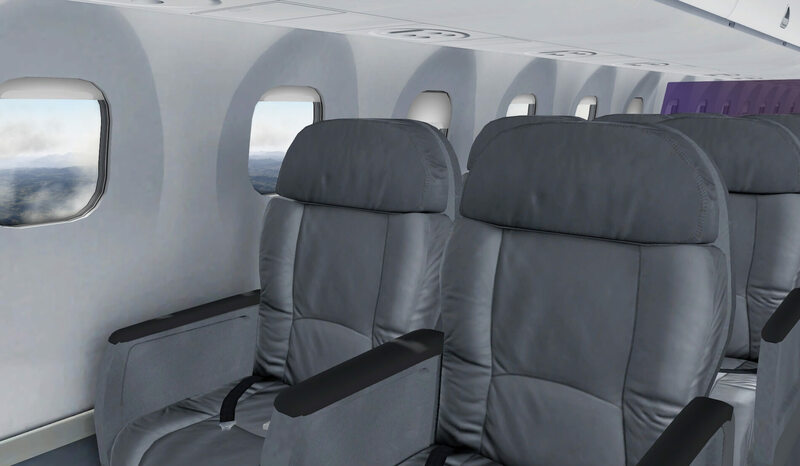 What said, they are semi-transparent so from the business/first class you can look to the economy class or vice versa. There’s – logically – no individual passenger lighting control available, but instead there’s a nice cabin lighting that switches ON automatically whenever the external lighting conditions are low unless there’s a separate cockpit lighting switch for the cabin, but I haven’t found that yet. 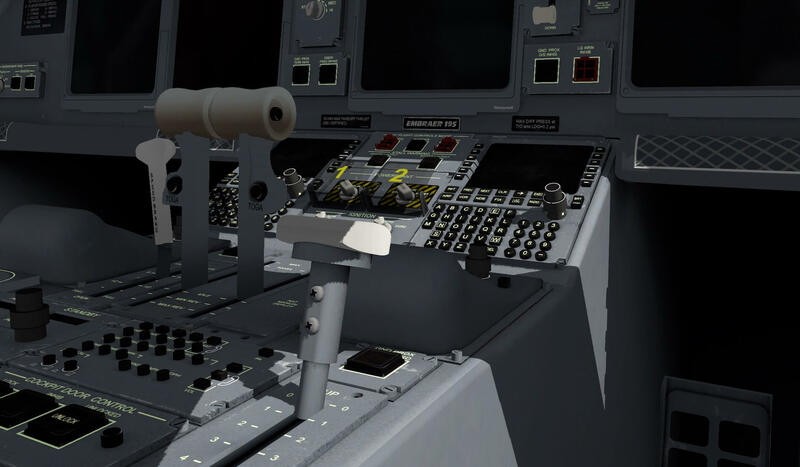 From the virtual cabin, you can enter the 3D cockpit via the animated cockpit door. Click the knob, and the door opens for you. Don’t forget when you step into the cockpit that the cockpit floor lies slightly higher than the passenger floor. A clean cockpit with not much weathering, at least, from a distance although the seat tracks, floor carpet, seat rails are new. The same “new” look and feel is applicable for the pedestal rear end. No scratch at all which is also the same for the cockpit sidewall and ceiling. But when it comes to the individual panels on the pedestal, overhead panel and centre instrument panel, it turns out that these sub-panels do have a weathered look. Small scratches are visible what give each panel a realistic look. If you like that kind of weathering is a matter of taste. The reality is that within no-time you’ll find scratches everywhere, bread crumps at places you never expect (is a little bit difficult to add this in a simulated model), semi glossy spots around knobs that are used often etc. Looking to the control wheels, I’m surprised that they have no “used” areas at all. It looks brand new and yes, that could be when the aircraft is just picked up from the factory which is in this case true, or when the aircraft has had a D inspection. 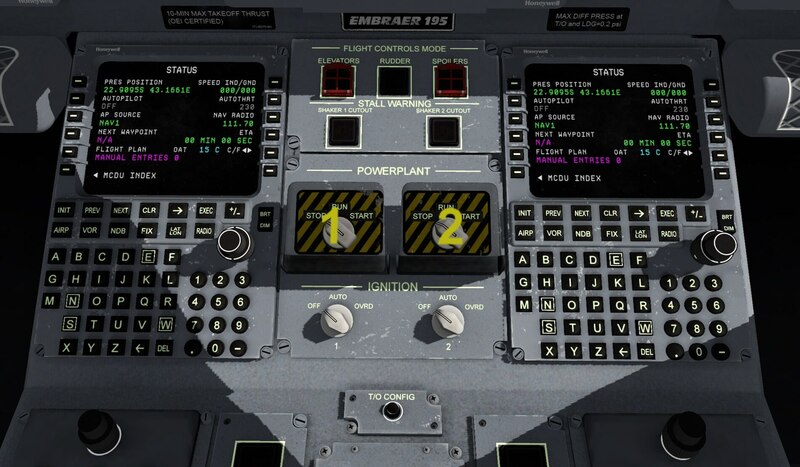 Whatever the reason is, the control wheel looks nice and have the right 3D model/shape. 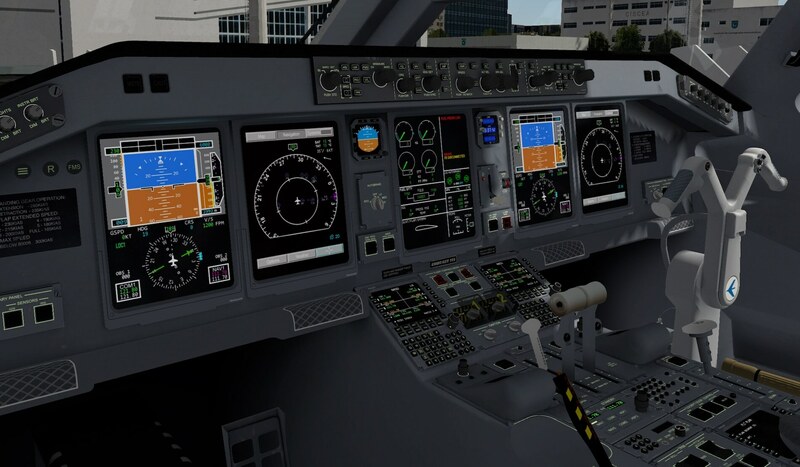 Hold on, how do these E-Jet cockpits look then in real? 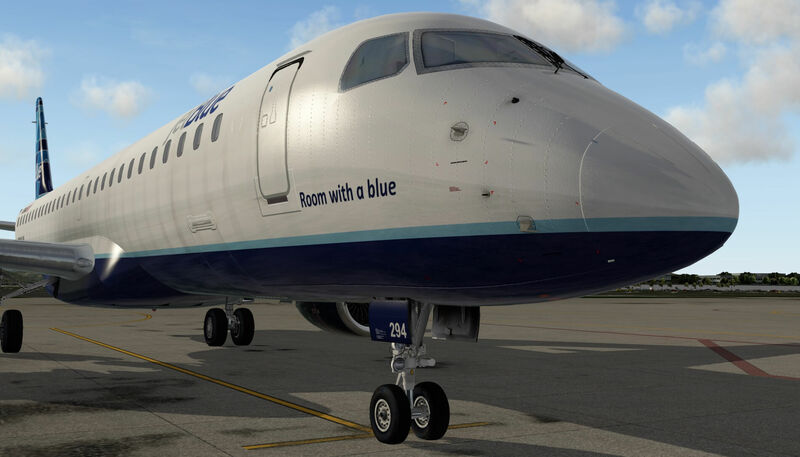 Let’s check that out with the following real Embraer E-Jets photos. Screenshots courtesy of Philippe Ballerstedt, Johannes Ehlen (Airliners.Net). When you look closely to those photos, and of course I’ve got no idea how often they are used, but they look quite “untouched”. 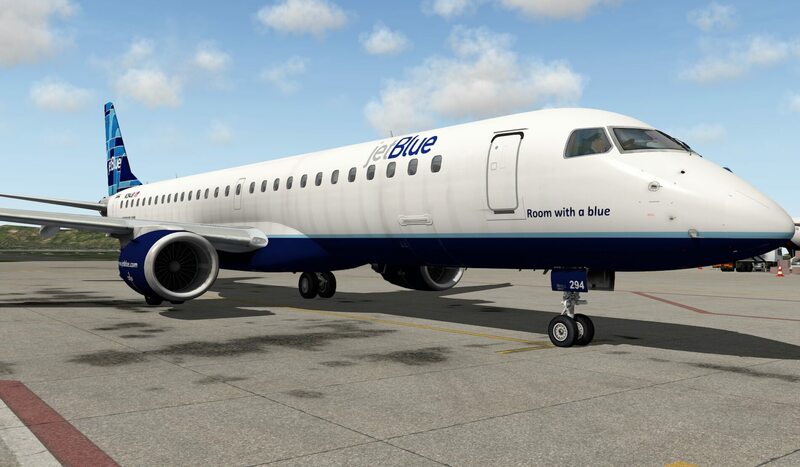 In that respect, the modelled X-Crafts does reflect how an Embraer E-195 could look like. 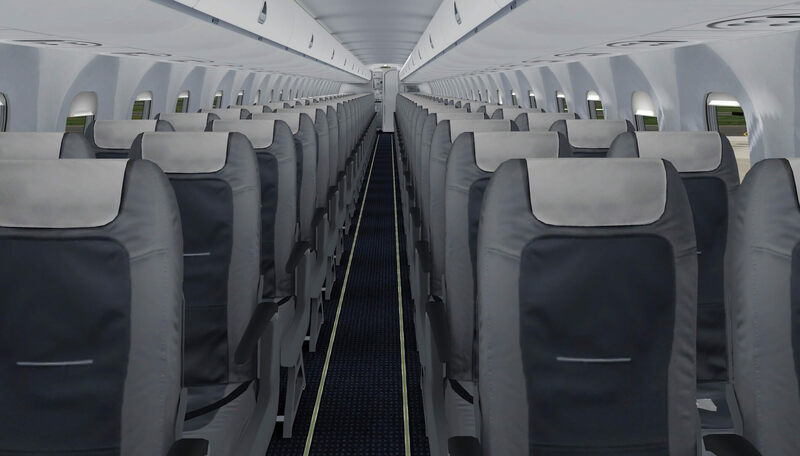 The clean look of each Embraer E-jet is something you like or not. With these five huge DU’s (Display Units) dominant positioned on the centre instrument panel, not much space is left for other regular instruments. 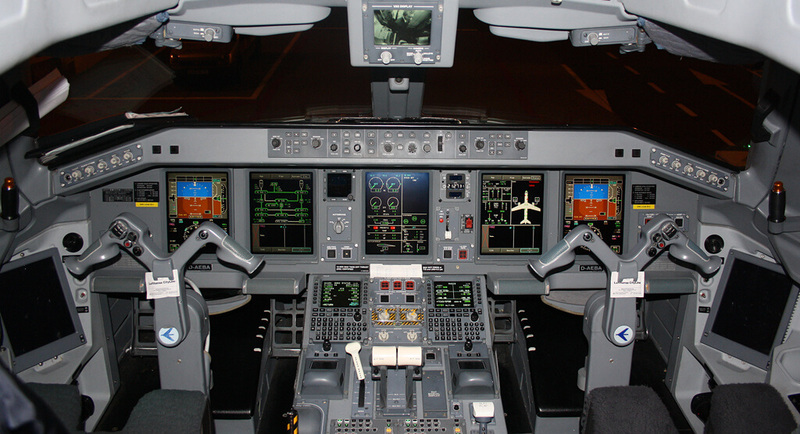 On the right-hand side of the EICAS DU you’ll see an ordinary digital clock, on the left of the same DU the IESS or Integrated Electronic Standby System. That’s it basically besides a couple of switches, selector knobs and the GEAR handle what’s mounted on the centre instrument panel. Further on, there’s the glareshield with the guidance panel. 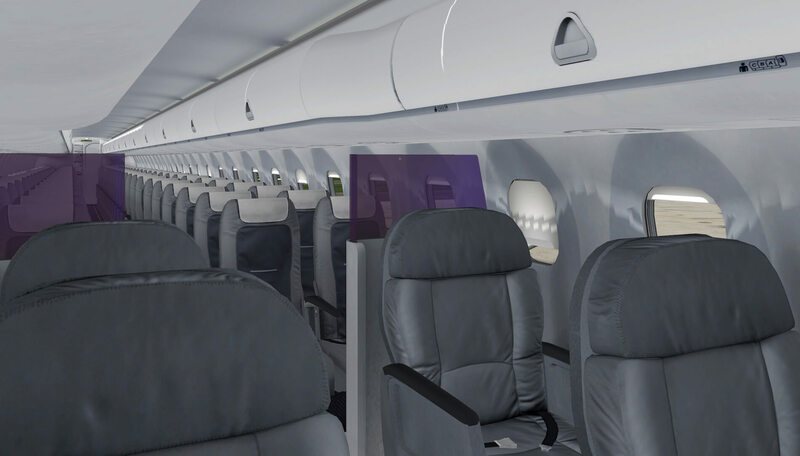 The guidance panel has a clean lay-out, but that’s typical for the Embraer E-Jet models. The pedestal isn’t so much different although more individual panels are positioned here. With the DU’s still OFF, I notice that the DU’s don’t offer a simulated display reflection which is, by the way, applicable to the windshield panels. I wrote about the windshield panel reflection already in part I, and also explained in this section that you can disable this reflection when you have a less powerful PC/Mac. Before I continue with some tests, let’s first put some electrical power to the aircraft. No, not via the GPU, but by starting the APU. When you don’t follow the right procedure (as I did) the APU selector switch isn’t simulated. That said, check the X-Crafts user manual page 45 “6.0 Start-Up Procedure”. 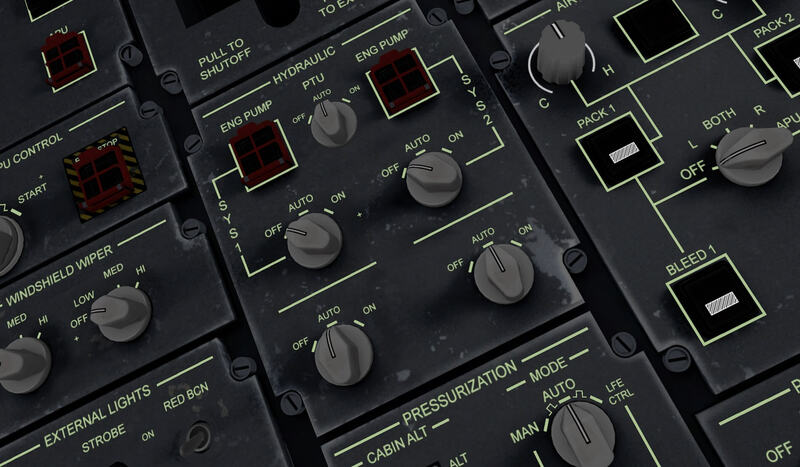 When you forget to select the AC FUEL PUMP switches to AUTO or ON, the APU selector isn’t simulated. Good to know! Ok, let’s start with a thorough look in the modelled 3D cockpit. I didn’t check the PFD, MFD and EICAS DUs for their 100 percent real factor. One thing I’ve seen which is not that difficult, in case you compare it with a real E-195 PFD, is the absence of the lighter coloured “horizon or sphere” within the brown/blue square. What’s also different – I have to be honest that this could be in real a “pin-programming” option and thus look different then is modelled – on the MFD “Systems” tab are the square ticked options while looking on some real photos, they are round and when active, filled green. Checking this with an AOM of the E190, it turns out that mostly it’s a mix of squared and round options whereas the rounds are filled green when active and the squared are filled with a tick when active. See for this an example out the AOM. In-between the captains MFD and the EICAS DU you have the IESS. This is for sure a simplified presentation of the real IESS although many vendors make this type of standby instrument so changes are possible. It’s not worth the discussion what’s good or bad, but it is worth to bring it to your attention. I think I miss as it is now on the lower part of the MFD, the simulated NAVIGATE (Vnav) section. As mentioned before, the pedestal is clean, but all the sub-panels have a weathered or used look. It looks good, no other words needed. 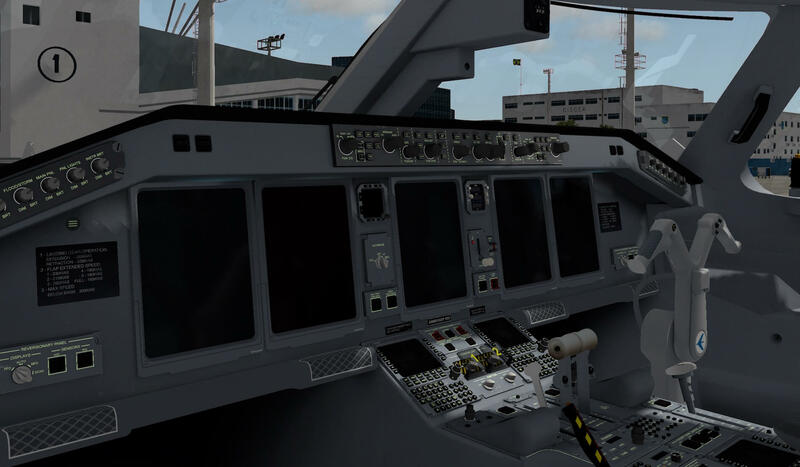 In the front, you’ll find the Tekton FMS MCDUs while at the right-hand AFT position of the pedestal, you’ll find the default X-Plane FMS CDU. Playing around with the left-hand Tekton MCDU tells me that these two MCDUs are interconnected with each other or in other words, this isn’t a split system. The same is also applicable for the guidance panel on the glareshield. This means, both FD (Flight Director) switches are interconnected. When you select FD 1 ON, FD 2 is also switched ON. The same is also applicable to the MFD PLAN/MAP mode switching. When you select on the left-hand MFD PLAN mode, the other MFD does the same. Back to the pedestal and overhead panel. On the pedestal, most of the switches, selectors are operational, but as far as I could see, on the TRIM sub-panel the YAW trim knob works (hold the knob when moving it) but the buttons do make a sound, but nothing seems to happen. Buttons on the small sub-panel FLIGHT CONTROLS MODE and STALL WARNING are as far as my knowledge goes, not modelled. Moving up to the overhead panel I see a realistic looking panel. The side walls of this panel are clean, with no scratch, but that’s something I’ve discussed and explained before. When I see all the individual sub-panels, I must conclude that every sub-panel has some scratches, dirty spots. In other words, I’m happy with that and I hope you too? The screenshots I made for this, are expressing that weathered look. I also tested the overhead panel switches and knobs and must conclude that several systems aren’t functional. That doesn’t mean they aren’t modelled, but at least, I can’t control or switch them. Some of these “non-simulated systems” that can’t be controlled are the DVDR CONTROL PANEL, the FUEL selectors AC PUMP 1 (2) and DC PUMP can’t be selected in ON, PASSENER SIGNS selector switch is fixed in AUTO so no OFF or ON position is possible, and finally, the WINDSHIELD WIPER selectors are interconnected to each other. This means, you can’t select only the left-hand windshield wiper. These are an example of overhead panel witches and/or selectors knobs that aren’t modelled. 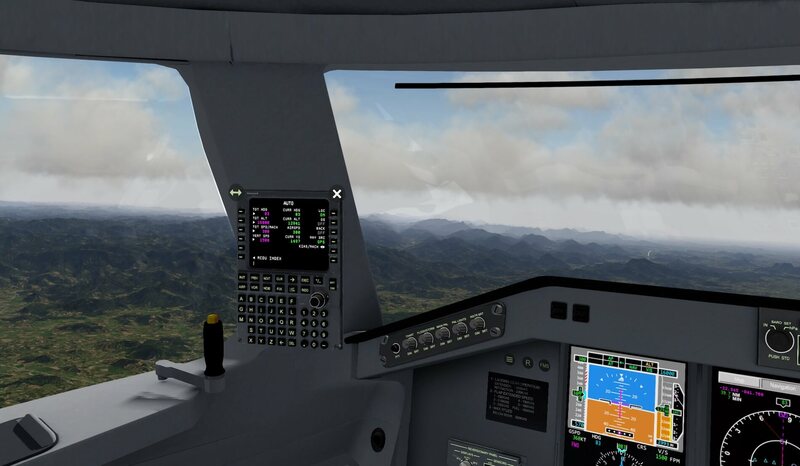 What’s my overall impression of the X-Crafts E-195 3D cockpit with simulated systems? I’m happy with what’s made, but I would encourage Marko, the lead developer, to make more systems switchable thus available. There’s always room for improvements and I sincerely hope that Marko takes this suggestion into account and sees what’s possible. Although this isn’t something you see and feel or can touch in the modelled aircraft, it’s worth to highlight this feature. 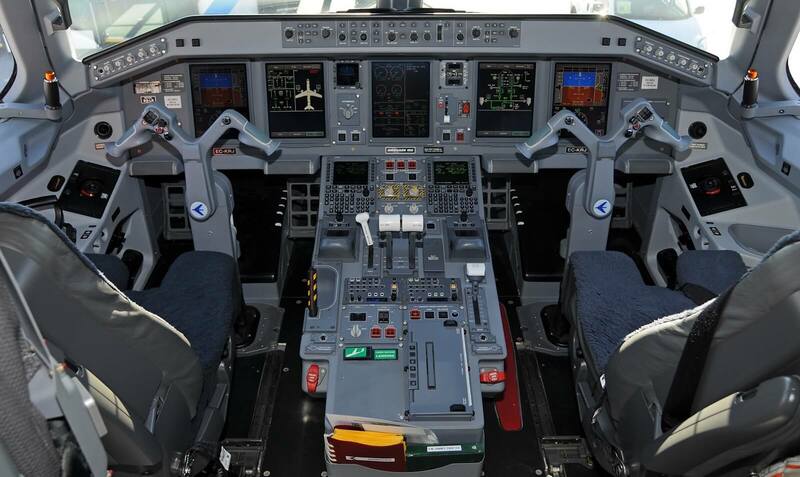 The Embraer E-190/E-195 are equipped with a fly-by-wire system (FBW). For those who aren’t aware of this and perhaps for those to offer them this article as a refresher …. fly-by-wire is an electronic system designed to operate the flight controls replacing the control cables of a conventional airplane. – Two Primary-ACEs (P-ACE) installed in the forward electronics bay. – Two Slat/Flap ACEs (SF-ACE) installed in the middle electronics bay. – One Horizontal Stabilizer ACE (HS-ACE) and one P-ACE installed in the aft electronics bay. 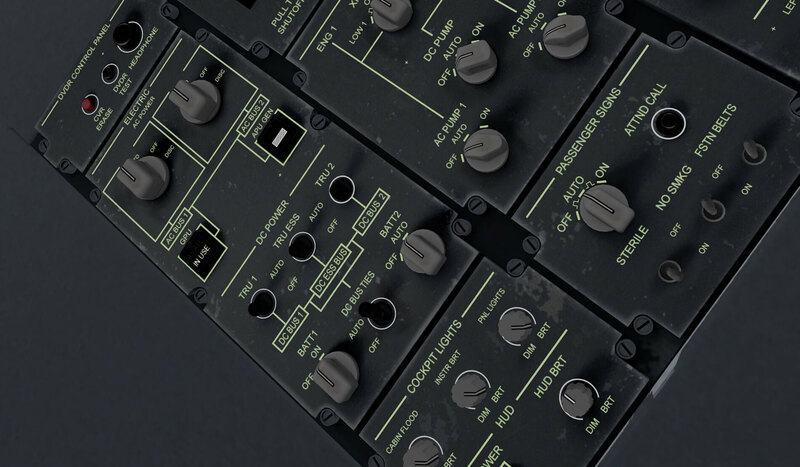 – FCM 1 and 2 are in the Modular Avionics Units # 1 (MAU 1). – FCM 3 and 4 are in the Modular Avionics Unit # 3 (MAU 3). The two P-ACE units connect the control column directly to the respective control surface, providing direct analog control of the rudder and elevator surface actuators. The two SF-ACE units control the slat and flaps and the HS-ACE unit controls the horizontal stabilizer. The FCMs provide software-based assistance to the P-ACE and is required for normal-mode operation of the flight control system. The FCM units are connected to the P-ACE via the Controller Area Network Bus (CAN BUS), providing digital inputs to the P-ACE, which are combined with pilot inputs. This is used to augment pilot inputs for different airspeeds, and provides other high level functions such as Angle-of-attack (AOA) limiting to the P-ACE units. By the way, a CANBUS system is something you’ll find in modern cars too. The NORMAL mode of the Flight Control Mode (FCM) provides software based airspeed gain schedules and control limits to the P-ACE, as well as high level functions while with the DIRECT mode the FCM is removed from the control loop (for instance, due to loss of airspeed data) and the control limits default to values set by hardware in the P-ACE. Mode selection is automatic, when a channel failure is detected or manual, by using a “Mode Select” switch on the Flight Control Panel. The “Mode Selection” switch toggles the Normal Channel of the active P-ACE to the Direct Channel of the standby P-ACE and continues as shown; pilot always has supreme control authority of the airplane since the FCMs cannot override a pilot input. This wasn’t the plan. Adding some additional test flights for this review wasn’t my plan, but I think it’s worth to add it. Flight from and to SBRJ is nice, but using the Tekton FMS MCDU is even more interesting. This will help me understanding this FMS own designed system and it will help me when planning my KTUS demo flight later in this review. The first that I need to do is making a flight plan from SBRJ to SBRJ thus, the same as with KTUS, a roundtrip above Brasilia. To create my flight plan, I used SkyVector (freeware online web browser) and FSWidgets QuickPlan (payware add-on). Although I have my preference for FSWidgets QuickPlan, the only disadvantage is that once the flight plan is saved and reloaded in FSWidgets IGMapHD for Mac, it does offer after loading the flight plan, the individual VOR/DME, VORTAC, NDB beacons. Suddenly all waypoints have become fixes so there’s no longer a distinction what the original source was (NDB, VOR, VORTAC or a fix). 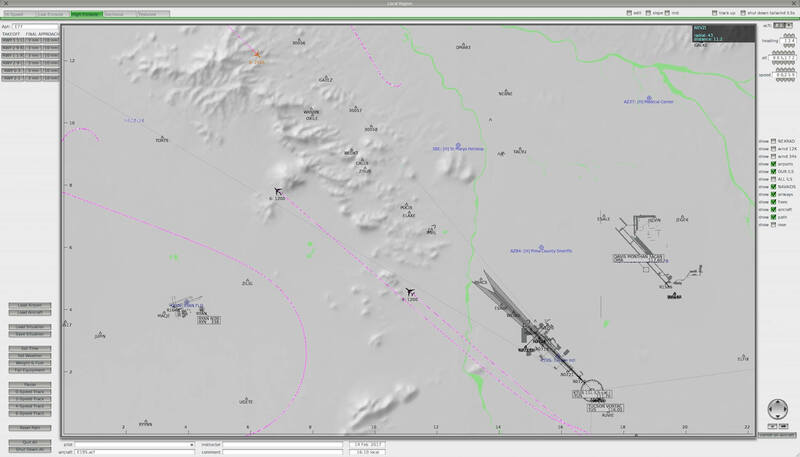 SkyVector is a very nice way to create your own flight plan although a free account is needed. Only issue is that you save the flight plan as “fpl” which isn’t the standard that can be read by X-Plane nor by the X-Crafts Tekton FMS. 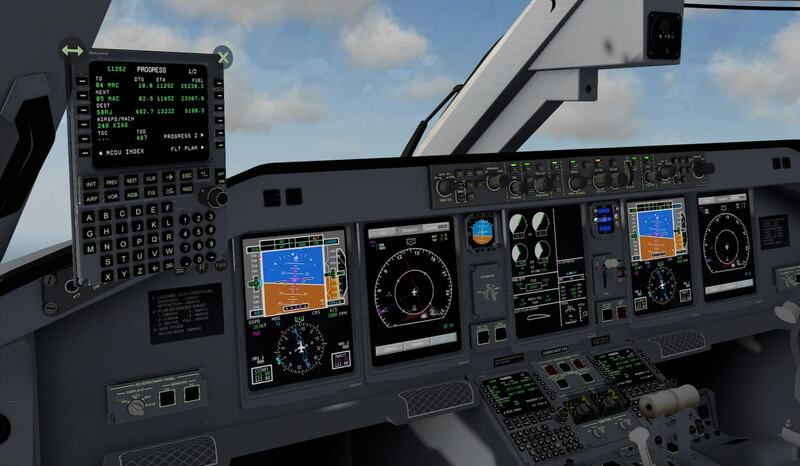 The X-Crafts FMS uses the default X-plane extension “fms“. 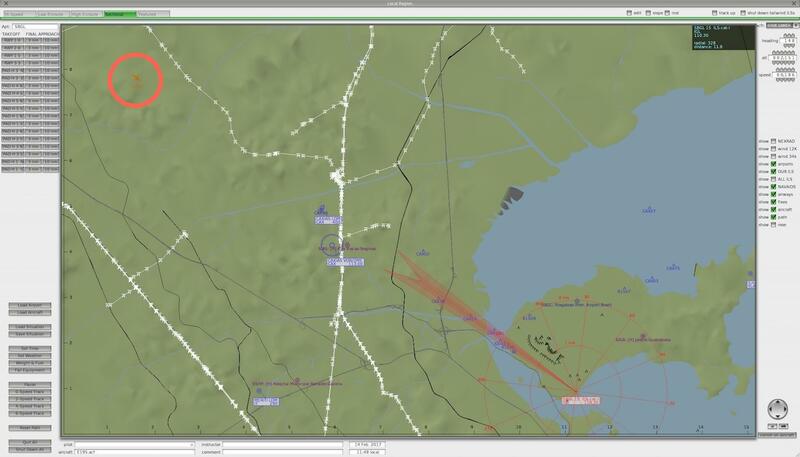 The first screenshot shows you the look and feel of SkyVector included the created SBRJ-SBRJ flight plan while the second screenshot comes from FSWidgets QuickPlan. It’s a matter of taste and deciding to go for freeware and/or payware. This is not a problem since you’re able via X-PlaneTools.Com target=”_blank”to convert your “fpl” into a “fms”. It’s one step more to do, but it works. Since I have QuickPlan and IGMapHD for Mac, I prefer it for now on to do it that way. 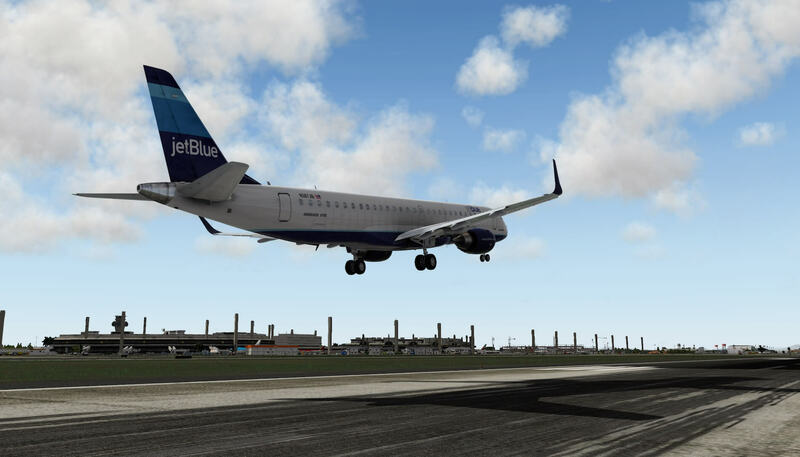 Adding additional round-trip flights in this review, gives me the chance to try out the Tekton FMS MCDU in more detail before using it for my KTUS demo flight. Many approaches are possible to get understanding the Tekton FMS MCDU. You can use the demo flight KTUS document as a guide and learn how to load a flight plan. Having the KTUS document aside me, will make it easy for me to load my SBRJ-SBRJ flight plan. 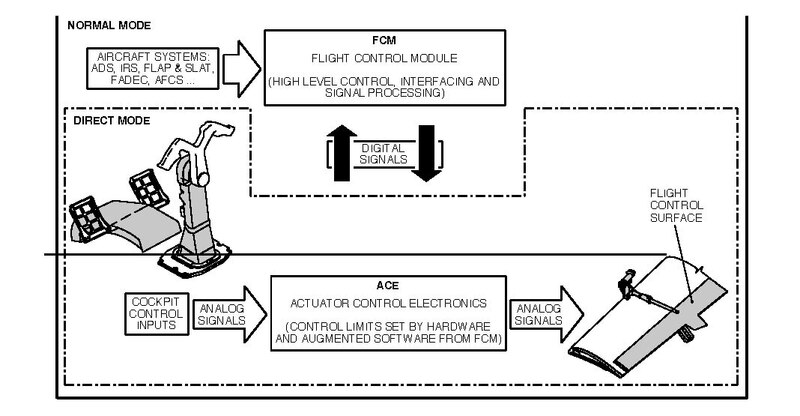 What I could do too, is printing out the Embraer E195 v2 FMS Manual or, when I don’t want to use ink and paper, I can read the Acrobat document via my Smartphone, tablet or another computer. Or …. if you don’t want to follow all the previous suggestions, I could visit the X-Crafts YouTube channel. All in all, enough possibilities. I decided to go for the option to keep the KTUS document near me and see where my knowledge stops. The whole idea of the modelled Tekton FMS MCDU isn’t so much different than the “other FMS MCDUs”, a different way however is needed to use the MCDU pages. Sorry to start with this; it’s not my intention to write a complete tutorial on how to enter a flight plan, what additional MCDU steps are needed as well and how to execute all the entered data. I didn’t check the whole FMS manual, but had a rough look into it. And no, I didn’t check all their YouTube movies, but quickly checked a couple of them. That said, it could be that divided over the different manuals and movies, a kind of step-by-step procedure can be found on how to enter all the necessary data into the MCDU. Altogether, entering data isn’t difficult, but keep a couple of things in mind when using the Tekton FMS MCDU. First thing to keep in mind; having the Tekton FMS flight plan connected to your AP, you should select, besides the NAV button on the Guidance Panel, also the FMS button. When the ROSE underneath the horizon on the PFD shows a green single pointer, you’re in VOR/LOC mode. 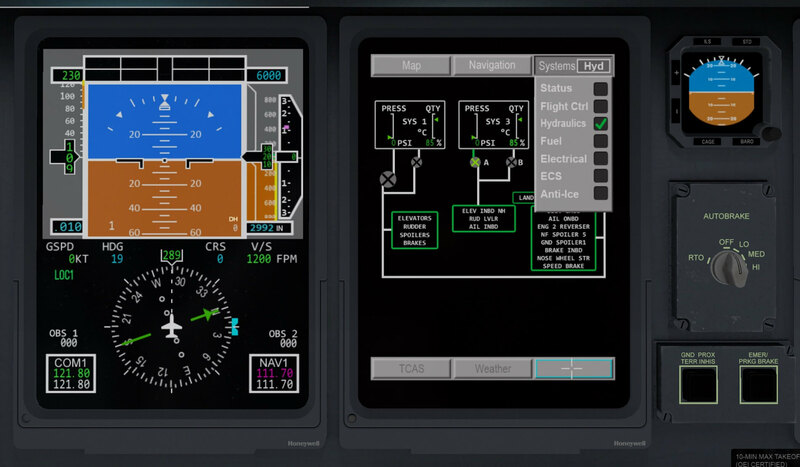 When you click the FMS button on the Guidance Panel, the pointer will be replaced by a cyan (light blue) coloured double pointer and in magenta FMS will be written on the PFD. When you select the NAV button, the AP will then follow the FMS flight plan. In the KTUS document is written how to set up the FMS with your flight plan, but this isn’t enough in my humble opinion and therefore, there is a kind of amplified checklist in the X-Crafts FMS manual. You’ll find it in chapter 4, starting on page 38. Perhaps one of the most important things of the FMS MCDU to keep in mind ….. don’t load the entered data yet (that is, don’t press the EXEC key) unless you’ve entered all of what’s needed! Once you’ve pressed the EXEC button on the FMS MCDU keyboard, you’ve got no more the possibility to change or enter data unless you start all over again by entering new DEPARTURE and ARRIVAL information and so on. In part I of the X-Crafts E-195 review, I mentioned something about the V speeds. 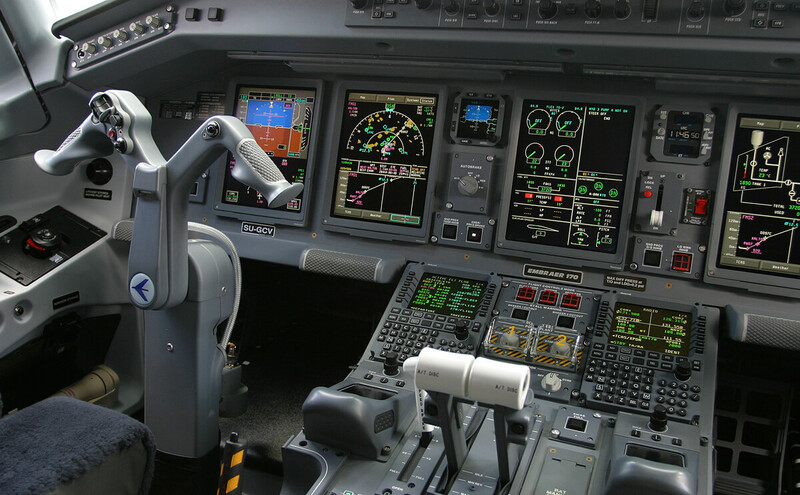 When you’ve loaded the E-195, and selected the FMS CDU, you’ve already access to the TO V speeds. For this there’s no need to enter any data nor the flight plan. On the PERF: TAKEOFF page you find these TO V speeds. Another item that can be changed on this page is the switching between Pounds (lbs) or Kilograms (Kgs). Watch out with this! When you change this unit from Lbs to Kgs, the weights (payload, total wt and fuel qualities) are only changed on this FMS MCDU page, but not on the MFD FUEL page. 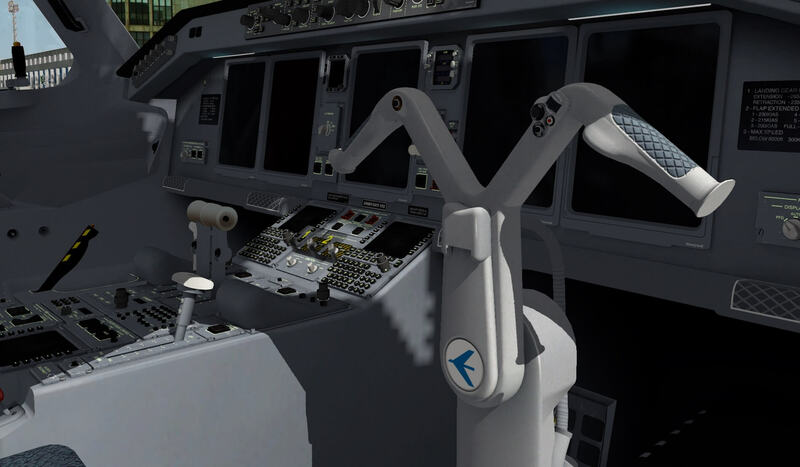 They stay in what you’ve set for the sim (Aircraft | Weight and Fuel) so although this is a nice option to swap on the MCDU between Kgs and Lbs, think twice when you do so! Select the FMS CDU via the FMS icon on the captain’s instrument panel. Enter SBRJ in the scratchpad. You can use the MCDU keyboard with your mouse or you can click use your PC/Mac keyboard. For this, click once left (where the mouse changes into a hand) of the word DEPARTURE on the top of the MCDU display. Select LSK 5L. SBRJ is copied from scratchpad. When you know the runway for your takeoff, select LSK 3R (SELECT RUNWAY >). Select the runway of your choice by rotating the MCDU knob and click the middle of the knob to confirm. Enter SBRJ in the scratchpad.Select LSK 5L. SBRJ is copied from scratchpad. Select from the list of prepared flight plan yours. In my case, it’s SBRJSBRJ. 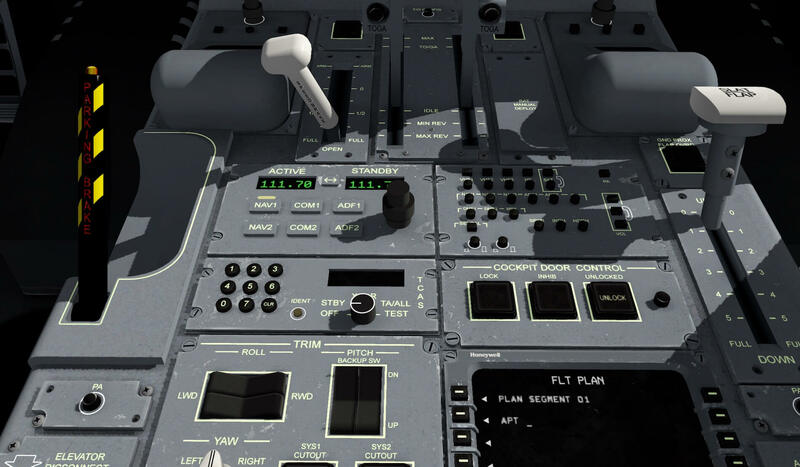 Select the correct flight plan by rotating the MCDU knob and click the middle of the knob to confirm. ROUTE STORED pops up momentarily on the MCDU DU. Select your FLAP position on the MCDU via LSK 1R. By default, the flap position is “1” but when you click LSK 1R you can change this to “2”. Logically, when changing the flap position, the takeoff speeds are automatically recalculated. Keep in mind which units you use …. Kgs or lbs. When you have your sim set to Pounds (Lbs) then double check that LSK 5R is set to “lbs” else click the LSK 5R to change to “Kgs”. When done, go to the next step. Normally you would expect that you would be able to see the approach speeds on the 3rd performance page, but even after entered the above data, it still gives me on the “PERF: TAKEOFF 2/3” MCDU page, a red message MISSING ROUTE ALT (S). The only way to get rid of this away and to have approach speeds calculated is that you also select the ARRIVAL RUNWAY. Select LSK 3R (SELECT RUNWAY >). 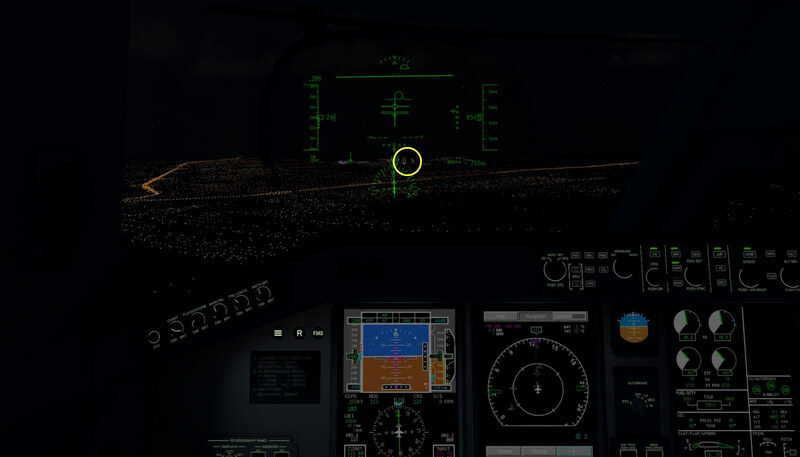 Find the runway of your choice for landing by rotating the MCDU knob and click the middle of the knob to confirm. Select LSK 6R (< PERF). This brings you to the “PERF: TAKEOFF 1/3” page, followed by a second time LSK 6R. You won’t see the red message in the scratchpad thus click for one more time LSK 6R. This brings you to the PERF: TAKEOFF 3/3” page. I still think, and yes it’s my personal thought and based on my real aviation knowledge, that there’s no need yet that you enter already your landing runway. Your arrival airport is know, but mostly even your STAR isn’t confirmed since many things on the way to your destination can change. Anyway, the above procedure doesn’t include how to add a SID, STAR, transition or even how to modify a SID/STAR. I think that’s well explained on the provided FMS manual and via the movies. One note to keep in mind in case you face this problem. When you’ve clicked on the MCDU keyboard the INIT button, followed by the EXEC button, your flight plan is available on the MFD with MAP/PLAN mode. When you, by accident, click again the INIT button on the MCDU, your flight plan is suddenly gone. Oops, all the work for nothing or can it easily be solved? Yes, it can be. Just click once more the EXEC button on the MCDU and your flight plan is back. Talking about the Tekton FMS MCDU and AIRAC cycles. 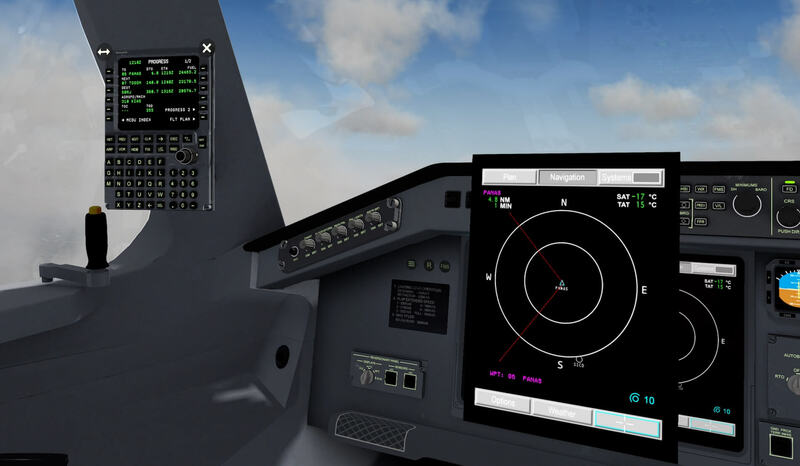 I understood that the Tekton FMS uses either the Aerosoft NavDataPro AIRAC cycle or, In case you don’t have this, it uses the X-Plane default navigation database, but which source it uses or which AIRAC cycle is active, is something I haven’t found on the Tekton FMS MCDU nor in the FMS manual. One last MCDU item do discuss; the LSK 6L AUTOPILOT page. It’s not common to see Auto Pilot options to be made on the MCDU, but I can tell you while spending many hours in the X-crafts E-195, it’s a great option. There’s no need to look constant down on the pedestal mounted MCDU. Just click left of the captain’s PFD on the grey circle with stripes, select the FMS circle and the floating MCDU is a fact. This is an even more user-friendly option to get it in view then with other developers. There you mostly need to click on the MCDU itself to get the popup version. Since you can’t set preselected values on the Guidance Panel, having this MCDU AUTOPILOT page on the MCDU is a nice feature. Of course, when you set an IAS (Indicated Air Speed), HDG, V/S or ALT via the knobs on the Guidance Panel, you see the output on the PFD, but more than that isn’t possible thus precise figures are in that way only possible via the MCDU AUTOPILOT page. 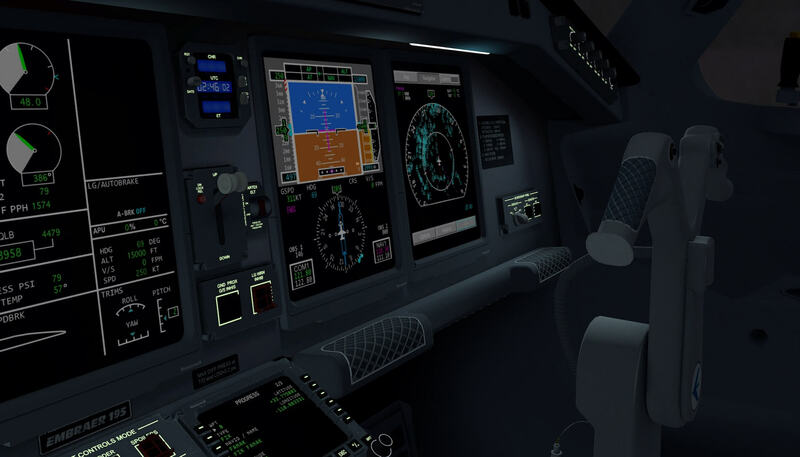 And since the floating MCDU is not obstructing anything in the cockpit, you can leave it in-view and use it as the navigation equipment for all your AP and navigation settings. Being at the AUTOPILOT page, you can switch with LSK 5R between knots and Mach value., This is also applicable for switching between NAV 1 and NAV 2. What else do we won’t more? I highlighted the presence of this additional add-on feature already in part I of my review. Before making my roundtrip flight, I think this is the right moment to discuss and test the plugin. As you can see for yourself, from the first set of two screenshots, the upper is without the reflection plugin, the second with the glossy effect being active. See the glossy look at the fuselage nose! 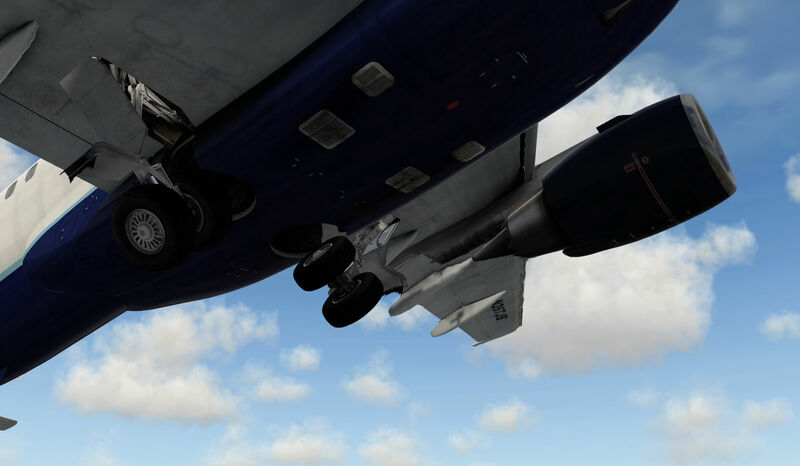 The same for the second set of screenshots; upper without, lower screenshot with the aircraft reflection plugin active. So let’s go and try it. The results are promising I must say. Currently, the glossy look is set to a value of 0.5. It can be found in the “settings.ini” file of the plugin folder “data”. If you don’t like the overall glossy, you can change with a text editor the value to 0.6, 0.7 or whatever you prefer. But what said before, I think that the value of 0.5 is a nice one to start with. 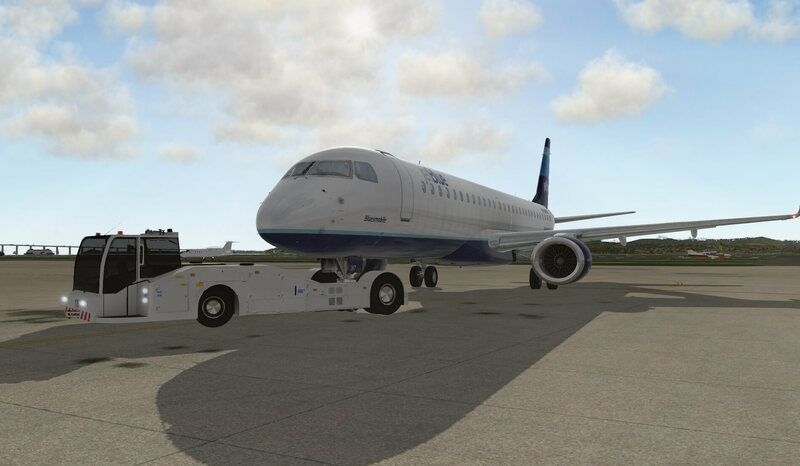 When parked at ramp position 11 SBRJ, I need a pushback and use for this the build in pushback function. Easy to use and with the “ghost” imagine of the aircraft here you would end after “x” meters with a left or right turn is great. 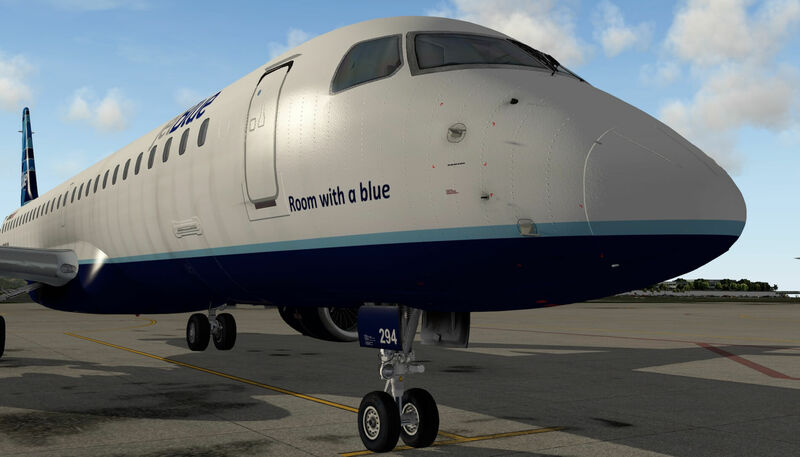 As far as I can recall, I’ve only seen this with the FlyJSim 737 and 727 series. 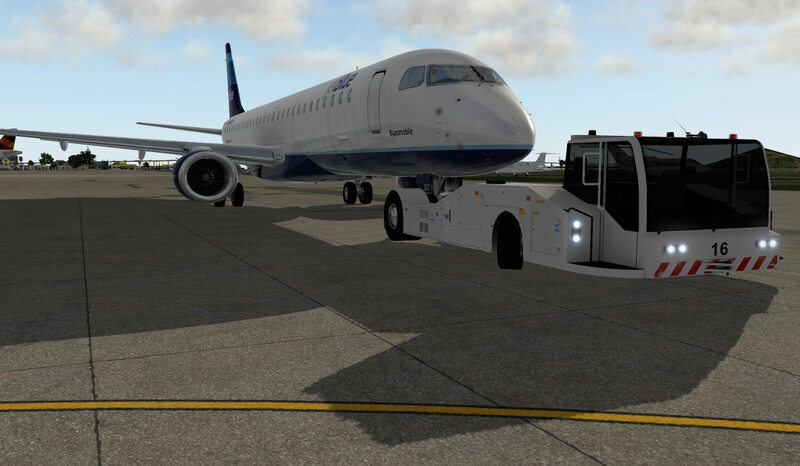 Besides the easiness of the pushback, the truck is nicely modelled and you’re instructed to do things before the actual pushback starts. Taxiing from ramp 11 to runway 02L is not a long distance. 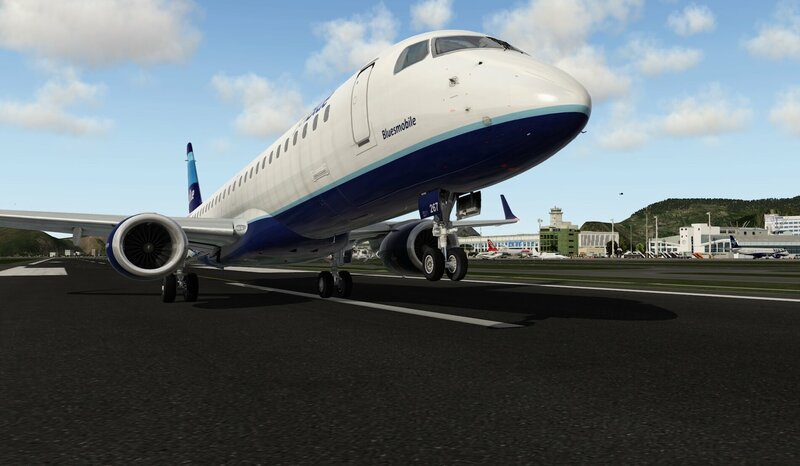 I’ve loaded my Embraer the maximum what’s possible via the default X-Plane menu “Weight and Fuel” and with that overall load, I’m wondering how the Embraer accelerates at take-off. I know it’s a personal feeling and although I checked it with a couple of YouTube Embraer movies, I still feel that the Embraer accelerates too fast. During the take-off run, I noticed that the aircraft starts bumping up and down with an increasing groundspeed. No idea why this is. Since you have the take-off speeds available via the MCDU PERF page 1, you know when to act, but you’ll also have callouts. After lift-off, I’ll try to fly the Embraer for a moment myself. What experienced with my first flight impressions, is still the same; it’s an easy aircraft to handle, but soon I want to engage the Auto Pilot and ATHR (Auto Thrust) and see how that goes. Although you’ve got enough sources to look at what your actual altitude is, your actual heading etc., the MCDU Auto Pilot page offers you also a lot of useful additional information like current heading, altitude, airspeed and vertical speed. Also, if LOC (read also VOR) is active, GS (Glide Slope) or back course as well as what the navigation source is. On this flight, this is GPS since it uses the flight plan. 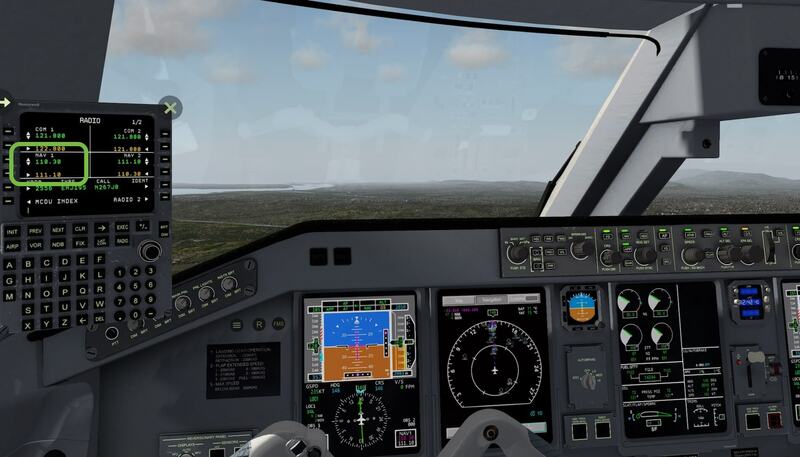 During my climb to the first initial altitude of FL100, followed by FL160 with the Auto Pilot and ATHR engaged, I have the time to find out more about how many frames (FPS | Frames Per Second) are available. I noticed already that the modelled X-Crafts E-195 v2 is frame rate friendly, as they say it so nice and it’s true. With SkyMAXX Pro 4.0.1 being active, oh oh, there are a lot of clouds outside and my X-Plane settings are also high, it’s not difficult to get frame rates ranging from 25 to 40 FPS or even higher. Although 25 FPS feels low, but what I said before, think about my X-Plane rendering settings and the amount of clouds. 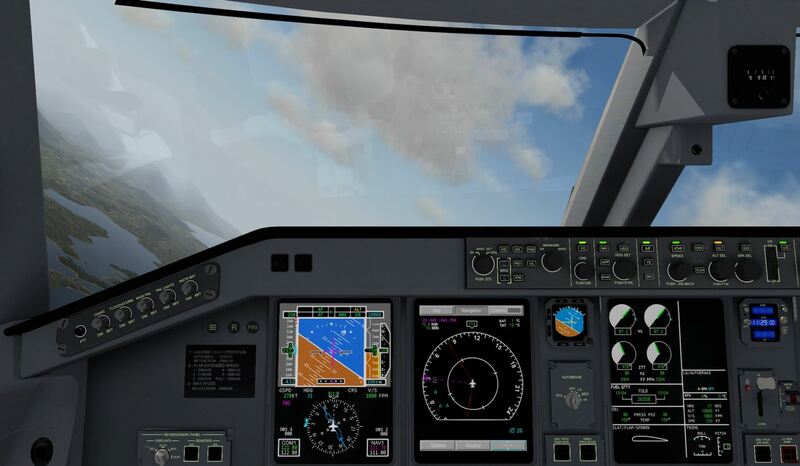 It’s amazing to see that even with all the floating objects in view – PFD, MFD, EICAS, FMS MCDU – the modelled aircraft still offers relatively good frame rates. During cruise, I have the time to look a little deeper into the MFD (Multi Function Display). The MFD offers a couple of aircraft synoptic. Just in case when you’ve never heard of the word synoptic; a synoptic is a simplified representation of a system. Anyway, you can read all about these synoptics in the user manual, but I want to focus a little bit on the navigation part, and then in particular to the MAP and PLAN modes. It becomes active when you click the top middle button “Navigation”. It comes up with either the MAP or PLAN mode. The MAP mode doesn’t look to me as a dedicated Embraer E-195 ND (Navigation Display) and after checking with the user manual page 27, Marko is open in that. Marko explains “I’m aware of the NAV display limitations. 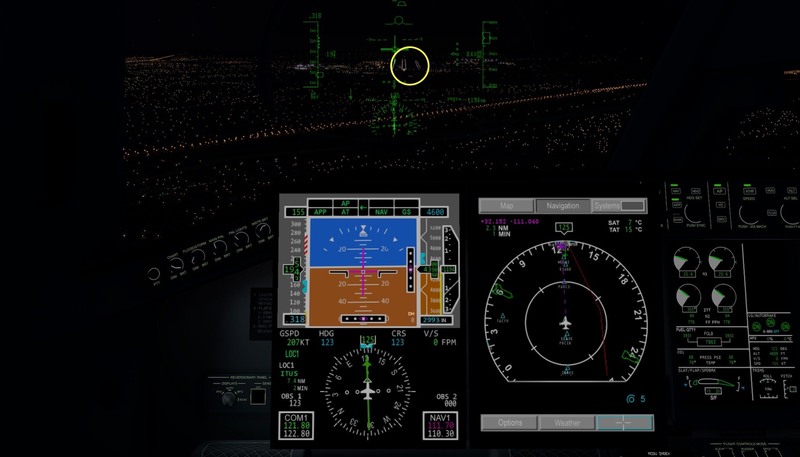 As I could only use the default X-Plane NAV display instrument I only had two choices; have a terrible NAV display, where no one can read anything – like on the default 747 for example-, or have an equally terrible navigation display, only with readable waypoints. I chose for option 2. It must be said that being so open as Marko wrote in the user guide, is also something to admire/to be proud of. The only thing you and I can do is waiting till the right person can help Marko remodelling this navigation display to real Embraer standards. While you enjoy this review – I hope – I’ll relax a bit in the virtual cabin. I enjoy the drink, and look outside via one of the window seats. I’m still relaxing in the business class but I’ve decided to change the arrival airport. Not a big change since it will be on the way towards Rio de Janeiro. In fact, it will be an arrival at the International Airport Rio de Janeiro (SBGL). That said and decided, we could leave the MCDU as it is, but why not changing the arrival airport and the intended runway. Changing to airport to SBGL goes via LSK 5L while the arrival runway which will be 15, is changed via LSK 3R being on the ARRIVAL page. The same applies for, of course if applicable, changing via LSK 4R the STAR (Standard Terminal Arrival Route), via LSK 5R changing the approach transition and finally, via LSK 6R the actual approach for runway 15. When this is done, I set at the MCDU RADIO page NAV 1, for a frequency of 110.30 and set on the guidance panel a CRS of 146. I could use for this also the floating RADIO panel. After that, when we’re close enough to the airport, I select the APP button on the guidance panel. This will in turn illuminate an amber bar in the APP, NAV (read LOC) and G/S buttons. In the PFD FMA (Flight Mode Annunciator) section, amber APP, NAV and G/S is written. Everything is set I would say. And as is common in real, you can always decide to switch OFF the Auto Pilot. Since the FD is still available, you have guidance information on your PFD as well as the G/S magenta indicator. 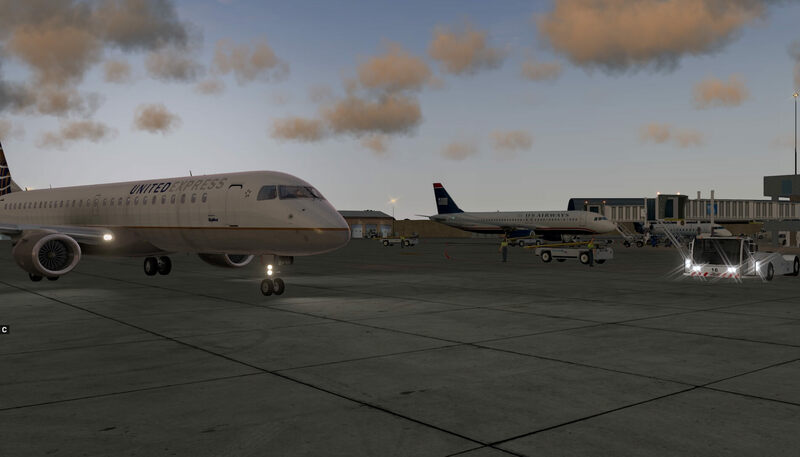 This final and third flight impressions has everything to do with the KTUS demo flight. I highlighted the necessary papers and the flight plan you need for this already in part I of the review. One thing that differs with this KTUS demo flight is that you need and will use a SID (Standard Instrument Departure) and STAR. No time to lose …. 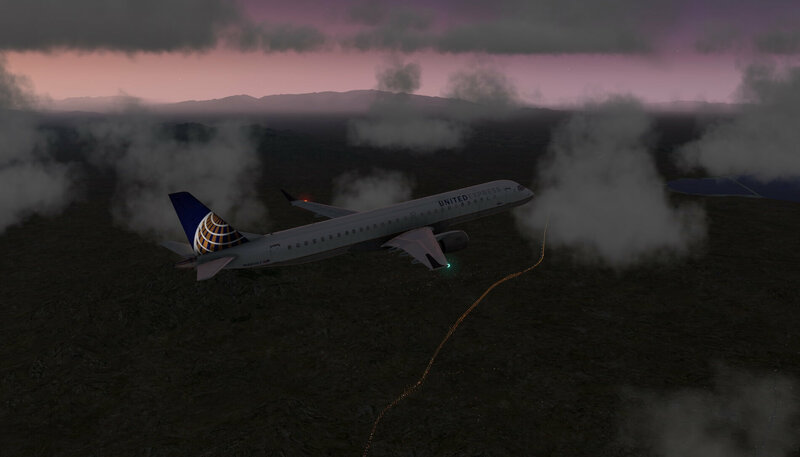 heading for Tucson International Airport (KTUS). 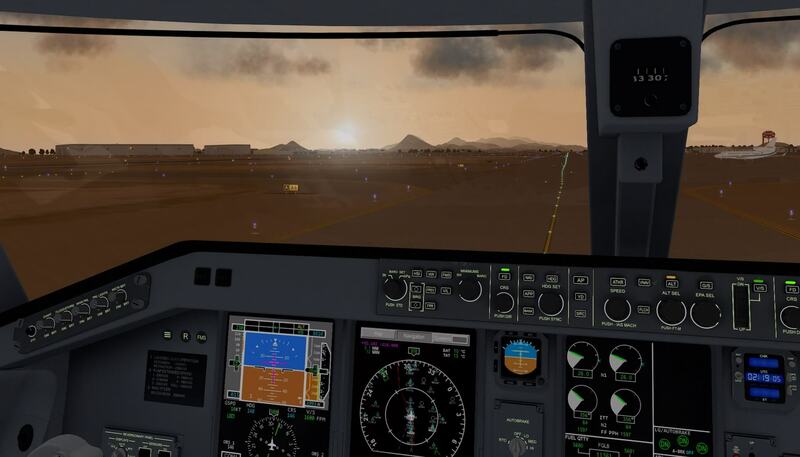 Check out what I wrote in part I of the previous review about the freeware add-on KTUS airport. 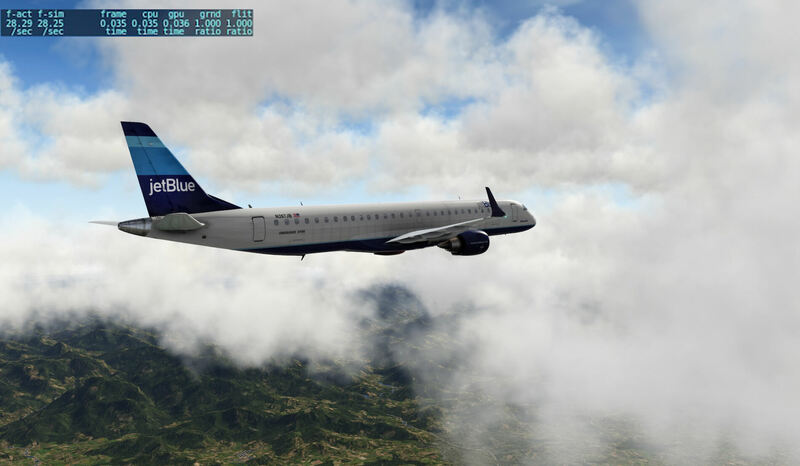 A nice freeware add-on and it gives your departure and arrival a little more charm. First of all …. the FMS MCDU programming. I discussed this already during my SBRJ roundtrips, but need to add something to the provided “E195 Demo flight instructions” manual. The step-by-step procedure I wrote for entering all the necessary data is basically based on this document with the exception that the manual doesn’t say anything about the PERF pages 2 and consequently page 3 that offers the approach speeds. The problem is, as I see it and perhaps this is incorrect, that during my SBRJ MCDU explanation, you can’t enter any data on the PERF 2 page when you’ve pressed the INIT and EXEC buttons on the MCDU. That’s what I’m missing in this KTUS demo flight document. Time of the day is free to choose and therefore, I’ve decide to go for sunset conditions. It distracts me from everything I see outside since it’s all dark, and instead I can concentrate myself on the instruments. By the way, something I learned during my real aviation days; always synchronise at a certain time frame your HDG bug on the PFD. Heading is, I assume also with the modelled Embraer, a basic AP function. That said, HDG is a default mode. In case there’s a reason that the AP reverts to HDG mode, the HDG bug is in the right position of the HDG you’re flying and no weird movements start. Got it? I’m not sure if this is typical for Mac X-Plane, but I’ve noticed that the AP can be sometimes very aggressive in steering commands. When climbing out to a certain assigned altitude via “a” V/S, it makes huge overshoots and sometimes I do see this also with heading changes. Large roll inputs are given and after a while it will stabilize to normal steering values, but it feels odd. What else can I add to this third flight impressions? Since the look and feel of the Tekton FMS MCDU is for sure different than other realistic but sometimes complex MCDUs, it’s worth during your flight to monitor the PROGRESS pages. For sure it’s in one of the manuals previously mentioned, but some additional attention is not a bad idea. The PROGRESS pages is accessible via the MCDU INDEX LSK 1R. It offers useful information about your actual – read real time – flight. Waypoint to go to, next waypoint distance to go and ETA (Estimate Time of Arrival), but also the distance to go to your destination, the distance to your TOD (Top of Descent), ALT set, LAT and LONG information and much more. With the floating MCDU in position, it’s great to have it this way. 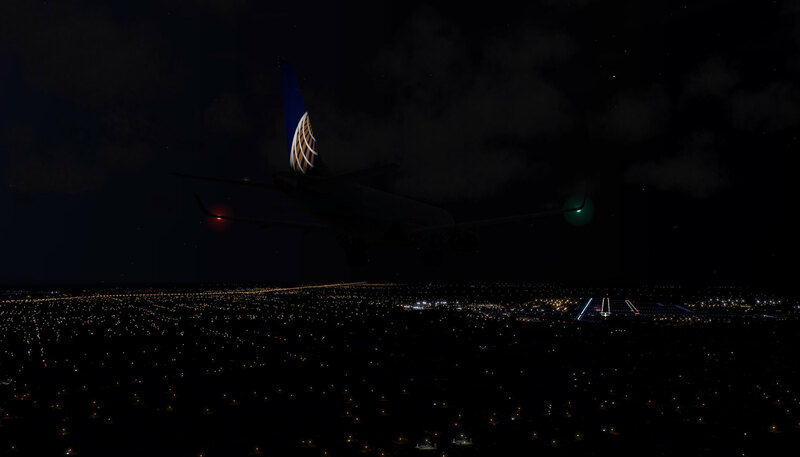 The approach is not much different then I experienced with Rio de Janeiro although this time it’s dark. Together with FSWidgets IGMapHD running on my second iMac, I can exactly monitor how the aircraft is doing along the LNAV flight path. Yes, I do have on the MFD a flight plan, the waypoints etc. but it’s never as clear as on a moving map. 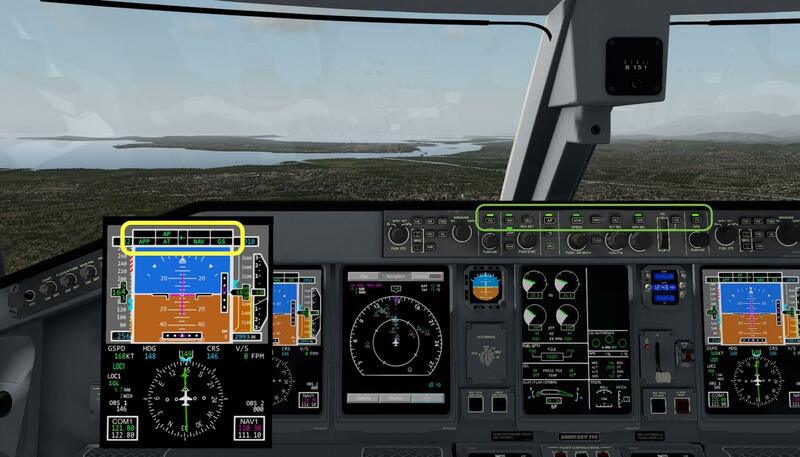 Whatever I have, I enter far before my actual approach via the floating radio panel the ILS frequency for KTUS 11L with a course of 123, and during the last turn towards the approach, I click the APP button. When the E-195 makes the last turn, and starts to follow the localizer and after a while the glide slope, it’s time for me to switch to the 2D cockpit. The only reason that I do that is because of the HUD (Head Up Display). It’s only available in the 2D cockpit, and I’m curious how this looks like. I won’t make a bunch of screenshots but a couple on the way down to the runway would be a nice idea. This aircraft review isn’t just a review as others. It has finally become a massive part I and part II impression of X-Crafts latest Embraer model. Is it perfect, is it without issues and/or flaws? Overall it’s OK, although in part I and part II of the review I’ve given a couple of suggestions to look for and to see if X-Crafts can modify or correct these. Knowing X-Crafts for a while and knowing their will to improve their X-Plane add-ons, I’m confident that X-Craft will manage this. At the end, it’s always “is it worth it” or should I go for “another Embraer” and so on? On purpose, I didn’t compare the reviewed X-Crafts E-195 v2 or their E-175 v2 with the SSG E-170 Evolution. 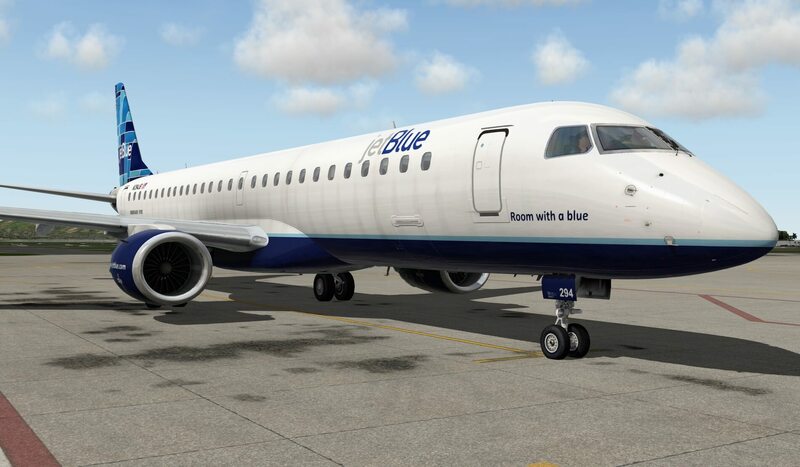 Not because this reviewed Embraer model is different than the SSG Evolution, not because I don’t own the SSG Evolution, but mainly because this will ruin the review which deals only with the X-Crafts E-195 v2. What is possible, at the end, is comparing the price of the SSG Evolution with the X-Crafts E-195 v2 and that’s quite interesting. The SSG E-170 Evolution cost you normally 49.95 USD while the X-Crafts E-195 v2 is 39.95 USD. As of this writing, the SSG E-170 Evolution is for a limited time (I suppose) reduced to 44.95 USD. Both models have a dedicated developed FMS although the programmed philosophy between these Flight Management Systems is different. Comparing the cockpit layout with the DU’s (Display Units) and checking these DU’s with how real E-170 or E195 EFIS systems look like, I must conclude that there’s a difference between the two add-on products. What I’ve seen so far, I think the X-Crafts Embraer v2 series are worth it. As I mentioned before, I think that there’s still some work to do. I sincerely hope that the MFD gets an update for the MAP and PLAN modes including a lower section of the same DU, a Vertical Navigation display. I’m not sure how difficult it is to create a realistic Embraer Auto Flight system, but time will learn if this is on the wish list. X-Craft’s goal from the beginning was to create a great high quality add-on that would be very interesting for both, the hard-core simmers as well as new flight sim users out there! The new improved version 2.0 is the most up to date X-Craft’s add-on bringing many new nice features and a great flying experience! Attention … attention …. 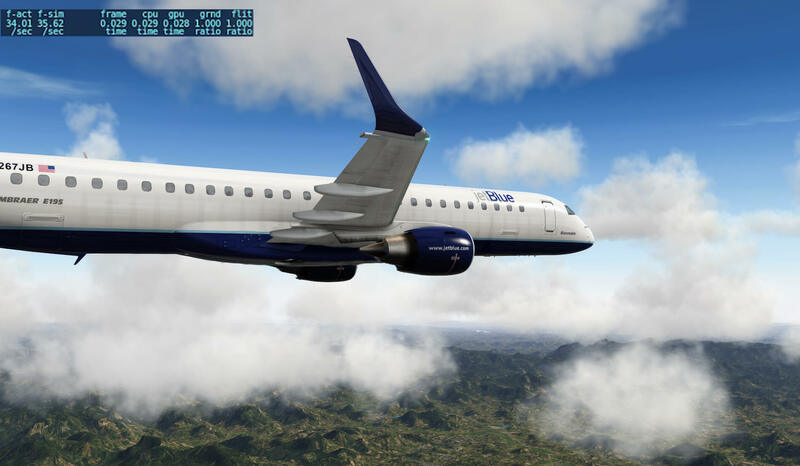 some interesting notes for those who are looking for both X-Crafts Embraer E-175 and E-195 aircraft; check out this X-Crafts deal via this X-Plane.Org link. 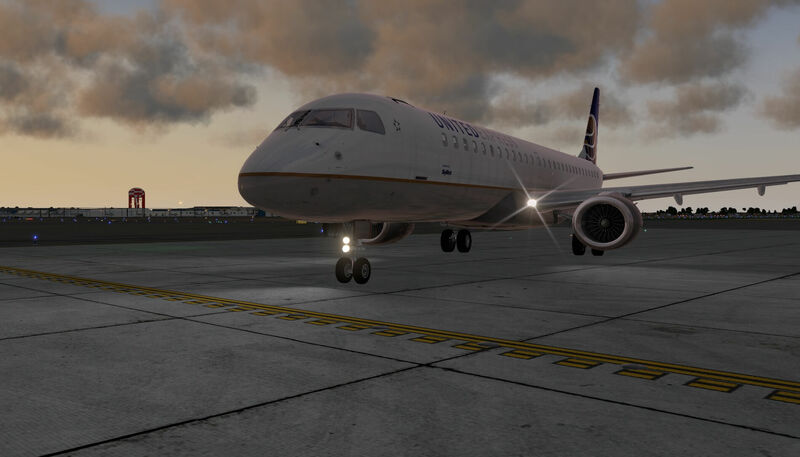 If you own a previous version of the E195 (ERJ 195 LR), you can get this version 2.0 for only 20 USD. Please check your original E-195 invoice at the store to find the discount coupon. Feel free to contact me if you’ve got additional questions related to this impression. You can reach me via email Angelique.van.Campen@gmail.com or to Angelique@X-Plained.com. I am surprised that you did not comment more on the autopilot’s shortcomings. I have experienced both significant throttle surging and porpoising making it probably the touchiest AP I’ve come across. They seem to blame XP for the issues but we know that’s not true. Also, I don’t really care for the limited view from the front office. I prefer the less cockpit encroachment of the previous version. This one takes up too much real estate on the screen particularly on the width of the front window posts and “dashboard” height. Yes, I can wiggle around to mitigate these issues but I shouldn’t have to. Indeed, it is a beautiful model and one of my favorite ships to fly despite its shortcomings. Would like to see a patch for the AP and an alternate, “lighter” footprint cockpit offered. Not completely thru since I did mentioned issues about the AP, and I did mentioned that we’re dealing with a default XP AP which means it functions different then the real AP. Anyway, thanks for reading the reviews.